It feels good to be back on the blog again. Taking that much needed break has rejuvenated something within me. Stoked the flames of my creative passion, as it were. So now I’m back and ready to take control of my creative life. Okay, so I’m a bit worried. Right NOW I feel great and not at all stressed out by all my creative passions that just NEED attention from me 24/7, but I’m on holidays. Come Monday it’s back to my “day” job and school starts up again on Tuesday and somebody PLEASE hand me a paper bag RIGHT NOW because I am hyperventilating just thinking about it. I love that creativity has infused itself into all aspects of my life. And if my biggest stress is that I can’t seem to find enough hours in the day to release all this creative energy, well then SO WHAT?! My Muse might be hounding me to keep moving forward, but at least she showed up and is ready to give’r. Her and I are real good friends these days. Sure she’s a bit pushy, but aren’t we all sometimes? So I’m thinking since I managed to bottle up some enthusiasm while on holidays, I need to set up a game plan for my creativity. Lay out a plan for the Muse so her and I are on the same page. Sounds strange right? I know, but the only way to juggle all these balls is to set a plan in motion. That’s what I was thinking Thursday night. I’ll make a list and figure out the whats & whens. But first Starbucks….oh and then there’s all those emails to take care of….and YES, I just NEED to rearrange my writing room to incorporate my art. 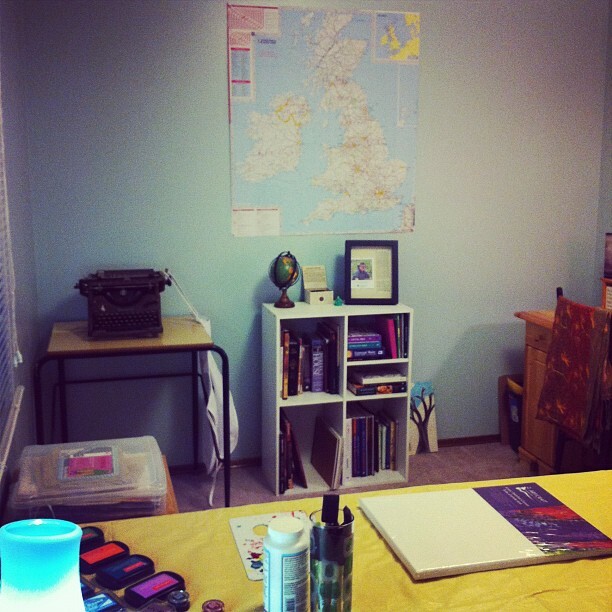 Long story short…I dragged hubby upstairs to move furniture with me to create a brand spanking new Creativity Studio! My 100 year old Underwood typewriter. A HUGE corkboard above my writing desk that continually inspires me. 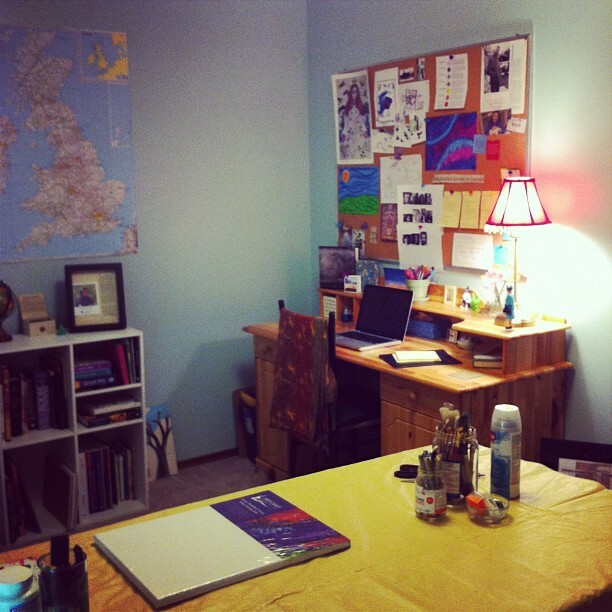 So there you have it, a new Creativity Studio for what I’m hoping will be a more productive yet relaxing experience. FYI – The Muse LOVES it! The space looks perfect for all of your projects and I’m glad to see the computer still there so you can WRITE!! Love reading about this exciting time in your life as you grab ahold of your future. Smooooooooshes! Oh this looks like so much FUN!!! I am so glad that you’ve got a new space, the muse is cooperating, and you’ve got the energy back in your creative stride! And might I say, I am JEALOUS of your typewriter. So insanely jealous. I love that you have a space. I have an office but I share it with the husband so you have inspired me to do something for myself on the landing. Your typewriter is older than mine. I have a Remington 5 and an old Royal. Don’t know their age but they look 20’s and 30’s. Enjoy your new space and I look forward to the magic you will make. LUCKY!! —> My 100 year old Underwood typewriter. What a fantastic idea on the map btw. Might steal that one, lol. I’m hoping my Dad will leave me his old Underwood Typewriter…it’s what I learned to type on when I was little! Congrats on your sales, you’ve got such beautiful attention to detail! I’m so happy the Queen has found a good home.